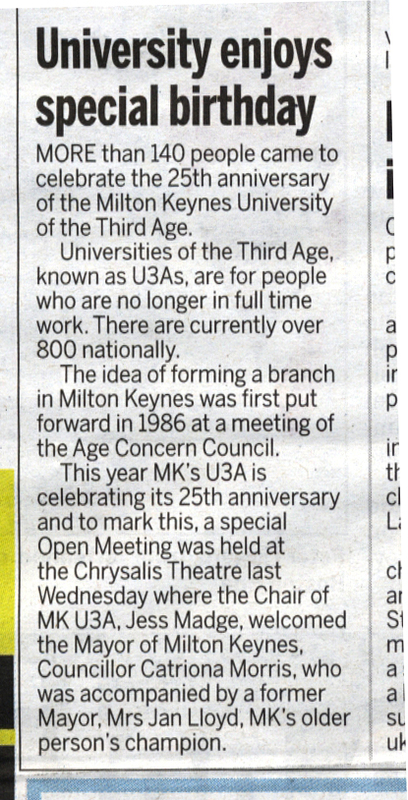 The idea of forming a branch in Milton Keynes was first put forward in 1986 at a meeting of the Age Concern Council. Three months after this, a public launch meeting was held at the Council Chamber, which the Mayor and Chairman of the Bucks County Council Education Committee attended. 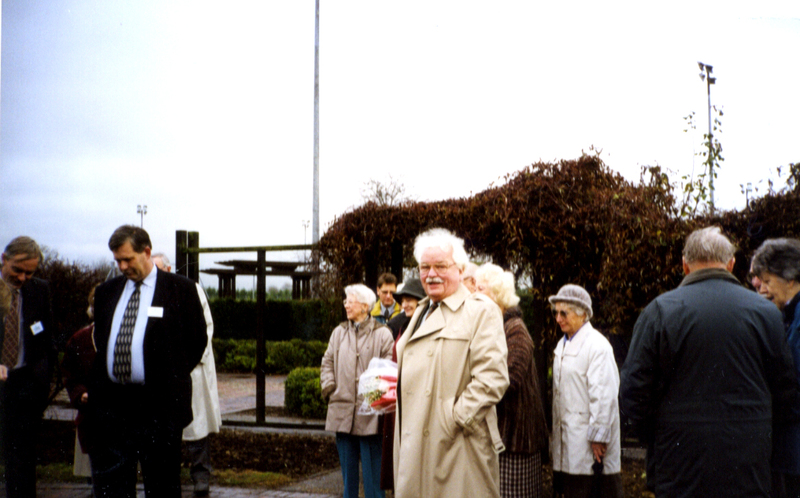 The first Open Meeting followed on 29 October 1987 and was held at the Civic Offices. It was addressed by a speaker from the Red Cross. By the end of that year there were almost 100 paid up members attending a variety of groups throughout the town. Now we can boast over a thousand members with about 90 different groups of interest ranging from art, music, gardening, walking, keep fit and many more. Universities of the Third Age, known as U3As, are for people who are no longer in full-time work. Their aim is to offer opportunities for members to share learning experiences in a wide range of interest groups for fun, not for qualifications. U3As are self-help, self-managed lifelong learning co-operatives. There are now over 800 nationally. Most of the information is still being collated, but the 25th Anniversary in 2012 is a good place to document things as they are now, with a few snippets of past events. The MKU3A Tree planting occurred at Woughton on the 10th Anniversary, as far as we know. Please get in touch if you have any further information about this event. 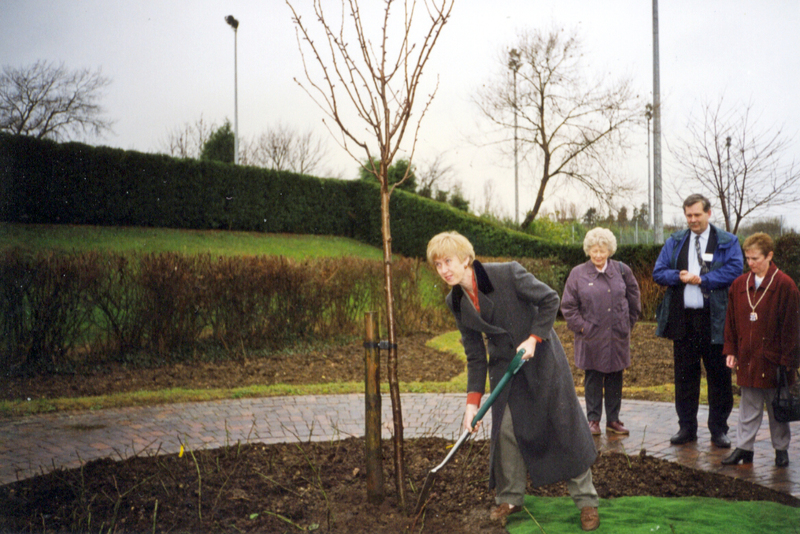 Our picture shows Phyllis Starkey Planting a commemorative tree at Woughton in about 1997. This was later lost when MK Dons took over the land to build their training ground. 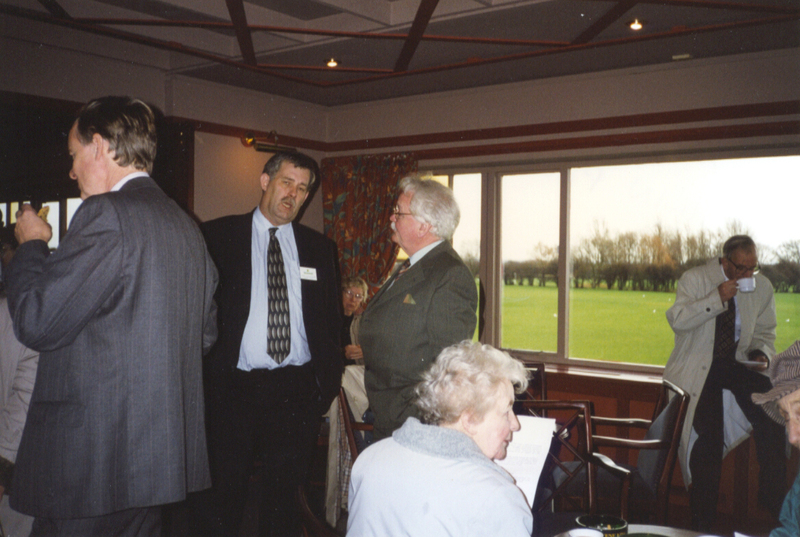 Len Coughlin of the U3A and Alan Proctor of Milton Keynes Council. Len Coughlin of the U3A, Sarah Jameson and Joan Campbell. Thanks to Jill Ifould for the loan of the photos. If anyone has any more information about this event, or other parts of our history we would much appreciate them. On 27 June 2012 about 140 members of MKU3A attended its 25th anniversary celebration. 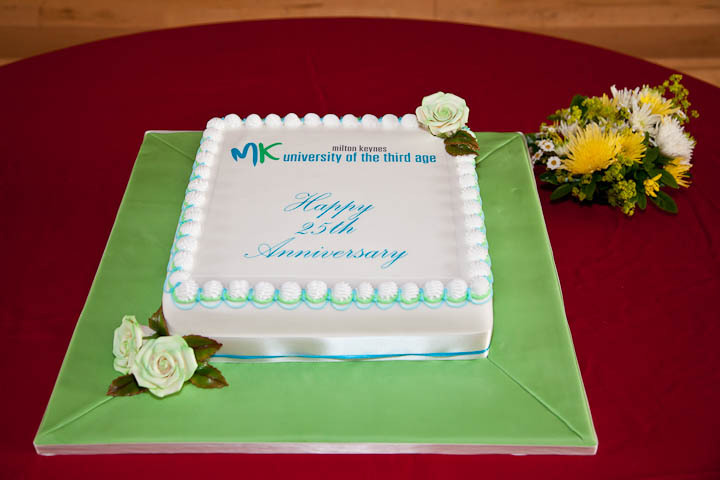 In 2013, MKU3A celebrated its 25th anniversary. To mark this, a special Open Meeting was held at the Chrysalis Theatre. The Chair of MKU3A, Jess Madge, welcomed the Mayor of Milton Keynes, Councillor Catriona Morris who was accompanied by a former Mayor, Mrs Jan Lloyd, MK’s older person’s champion. 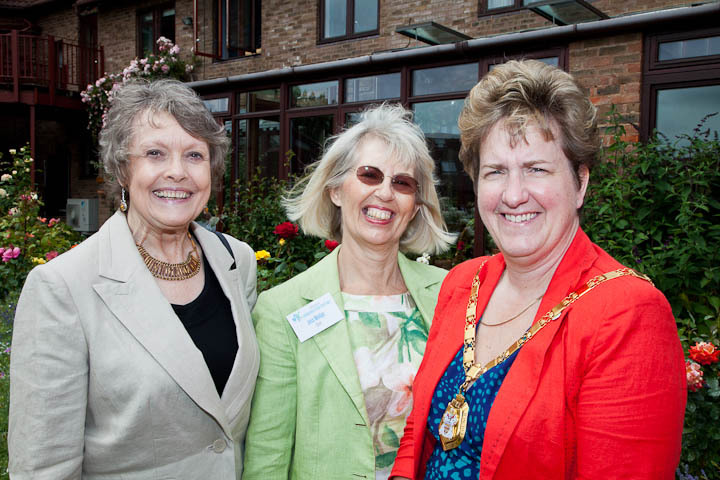 (from left to right) Mrs Jan Lloyd, MKU3A Chair Jess Madge and The Mayor of Milton Keynes, Councillor Catriona Morris. Representatives from five neighbouring U3As also attended, Dunstable, Buckingham, Flitwick, Ivel Valley, and Leighton/Linslade. The Guest speaker was Keith Baldwin, a competent raconteur with an innate sense of humour who gave a talk entitled, ‘When policemen and doctors start to look young’. He reminded the audience that most of them were born before lots of things that we now take for granted: credit cards, fish fingers, lycra, pizzas and instant coffee. People used to get married first, then live together, grass was for mowing and pot was something to cook with! 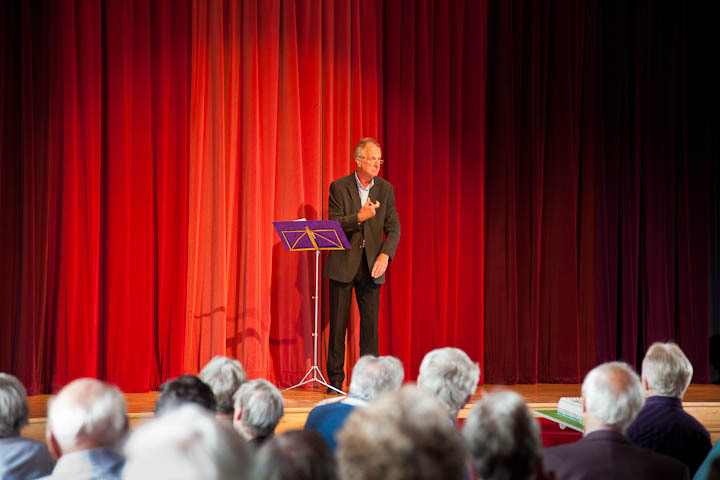 Guest Speaker, ‘The Tall Fellow’ Keith Baldwin gave a very humorous talk about growing old. The Mayor spoke to the audience about the importance of the older population in Milton Keynes as the city matures. In her short term of office so far, she said she had already crammed in 57 engagements in her first six weeks, and at three of them she met the Queen. 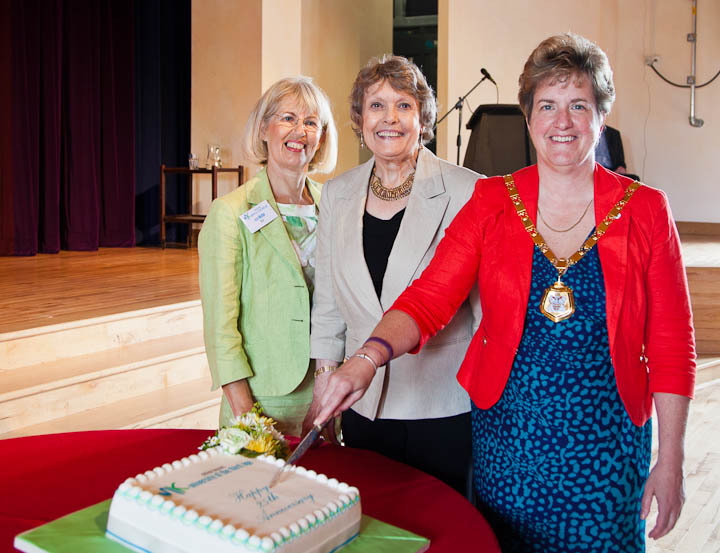 (left to right) Jess Madge, MKU3A Chair, Mrs Jan Lloyd and the The Mayor of Milton Keynes Councillor Catriona Morris cutting the Anniversary Cake. The Mayor did the honours and cut the cake and the afternoon concluded with the audience enjoying the cake, with a welcome cup of tea. 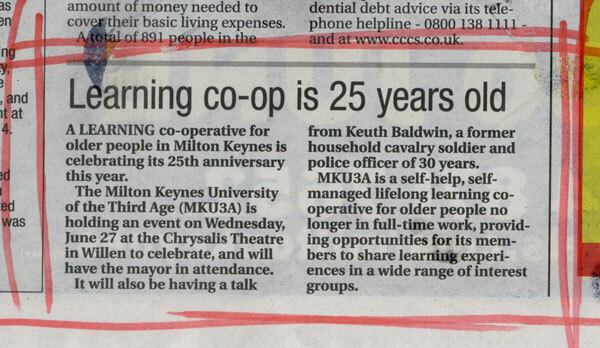 MK News Online article about the MKU3A 25th Anniversary talk and cake cutting by the Mayor.